This week I hosted a Drop In & Decorate party for my MOMS Club. 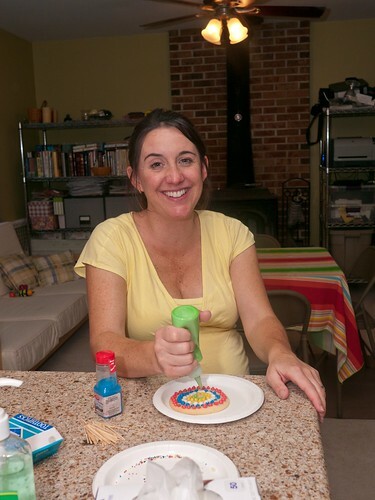 The idea is simple: decorate sugar cookies, then donate them to a local non-profit agency. 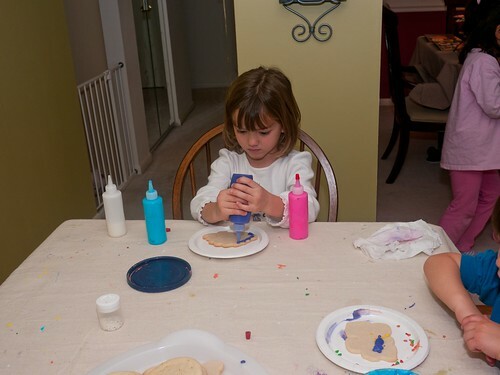 The kids had a great time using squirt bottles to decorate the sugar cookies. 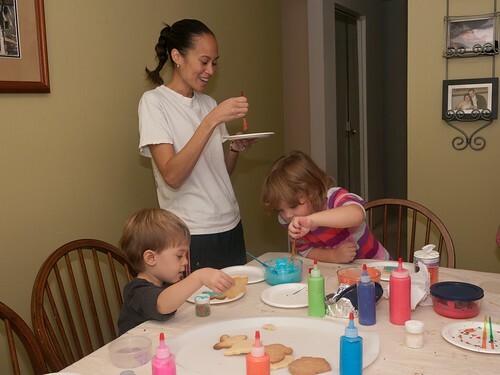 The kids also painted icing on the cookies. 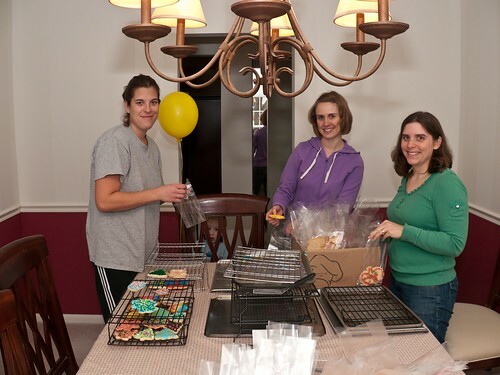 The moms joined in on the decorating fun too! 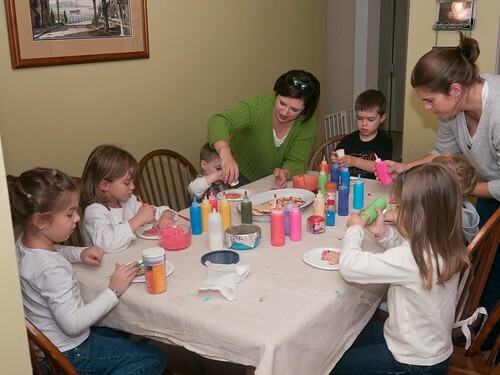 Throughout the day, over 40 kids and moms came to the house to decorate. Molly loved having so many friends to play with! 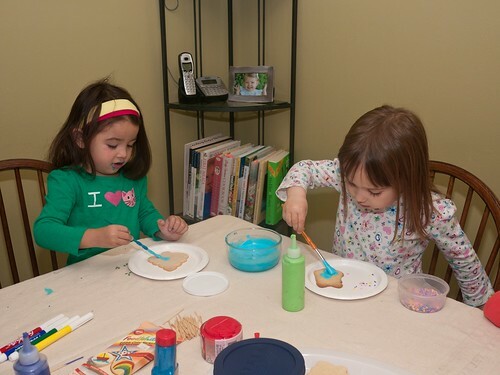 We had some creative designs created on the cookies. 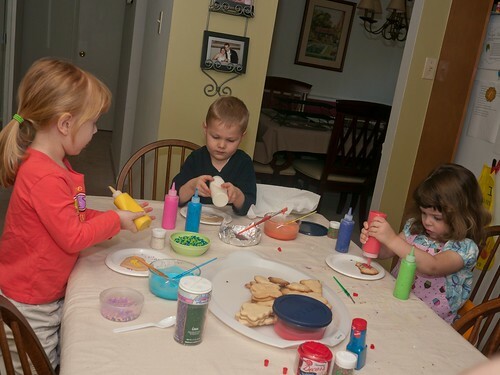 Everyone had such fun decorating that before I knew it we were out of cookies! 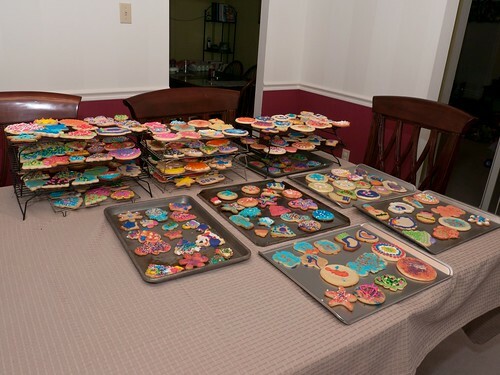 In the end, over 200 cookies were decorated. The dining room was so colorful and smelled heavenly! 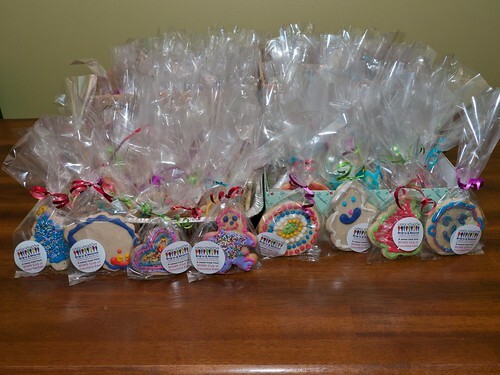 The cookies dried overnight and the next day we wrapped and boxed them for donation. I delivered 125 bags of sweet treats to the Grassroots Crisis Intervention Center. The party was a huge success! 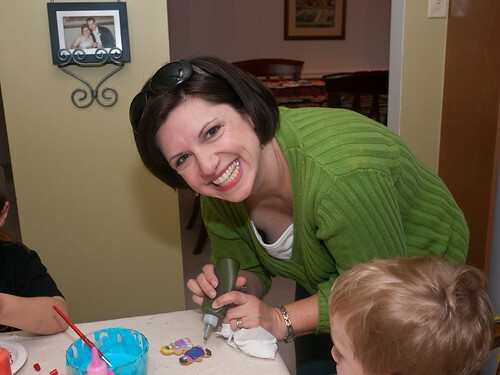 Several moms talked about hosting a party with their Girl Scouts and military wives groups. The great thing about these Drop In & Decorate parties is that you can have 5 people or 40 people. If you are interested too, all the information and resources to do so is on the Drop In & Decorate website. 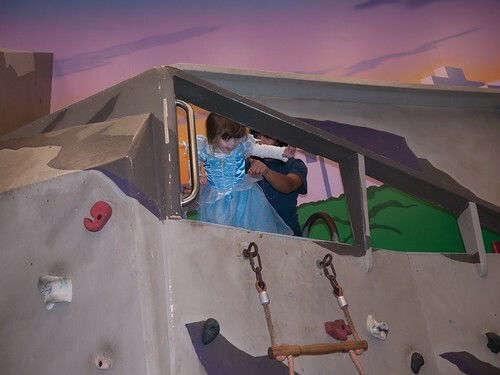 Molly and many of her school friends attended a Princess party and all came dressed for the occasion. Here's Molly at the top of the tower (which yes, is normally a climbing wall). 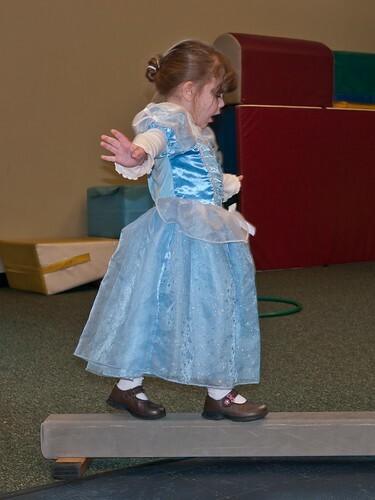 They played lots of princess-themed games. 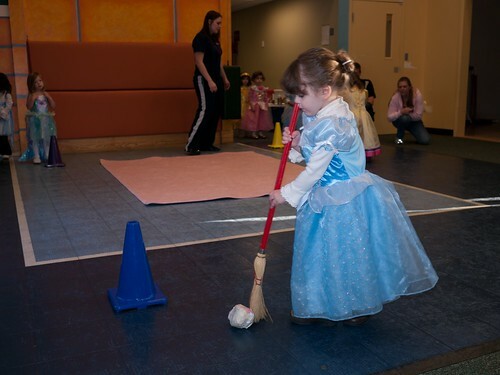 Here the girls are sweeping like Cinderella in a relay race. 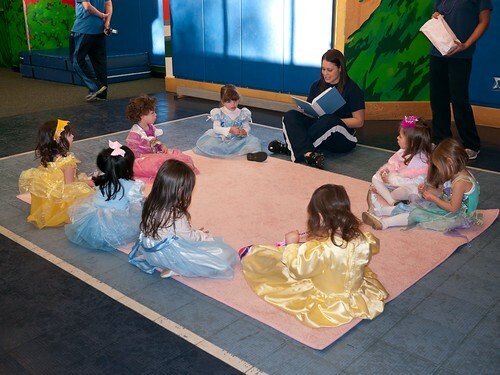 They were read several princess stories throughout the party. 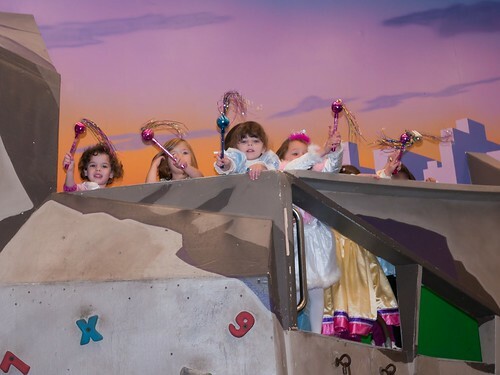 which ended a top the castle with princess wands for all! 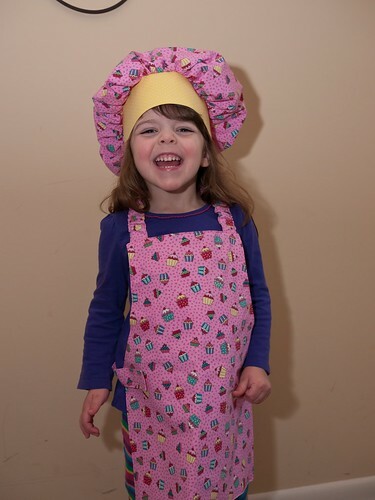 I made a chef's hat and apron for the birthday girl. Molly happily modeled it, then proceeded to indicate that she needs a hat to match her apron too! 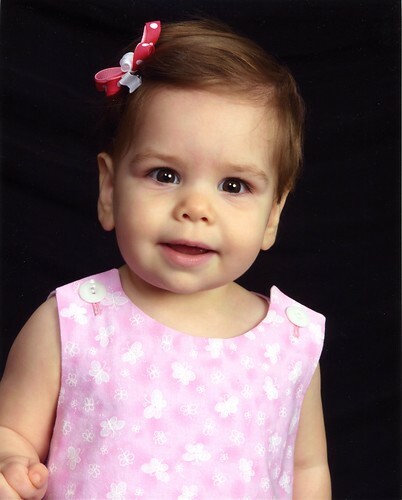 I know I'm a bit late in posting these, but I wanted to share Leah's 1 year portraits. My MOMS Club decided to spread a little Halloween cheer and sneak in the shadows to surprise each other with goodies. 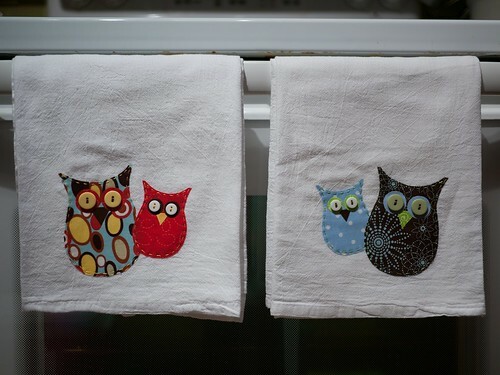 I saw these owl towels a few months ago and decided that they would be the perfect gift for Boo'ing. So, surprise Courtney and Amanda, it was me! 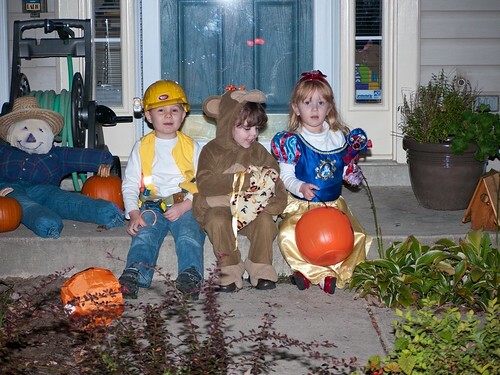 After trunk-or-treating, we went over to Simon's house to trick-or-treat in his neighborhood. Simon, Molly, and Keira are ready to go. 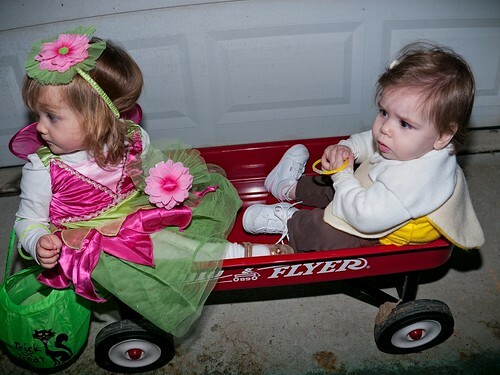 Leah and Matilda are ready to go as well, electing to ride in the wagon instead of walk like their older siblings. 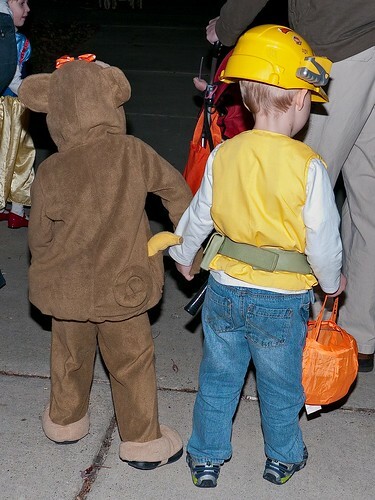 Best buds holding hands. So cute! 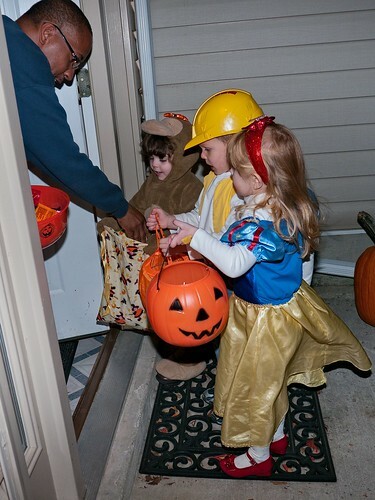 The big kids were pros at trick-or-treating since they had practice together last year. Simon was generally 10 yards ahead of everyone, but Molly did take the lead briefly in order to get to knock on a door. 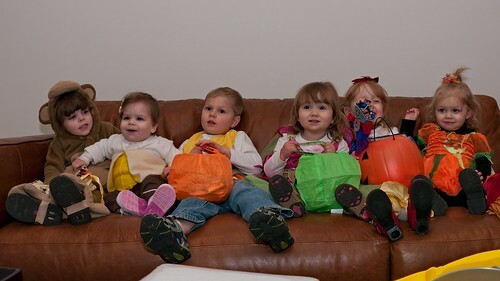 We made the kids pose for this picture before they were allowed to dig into their candy! 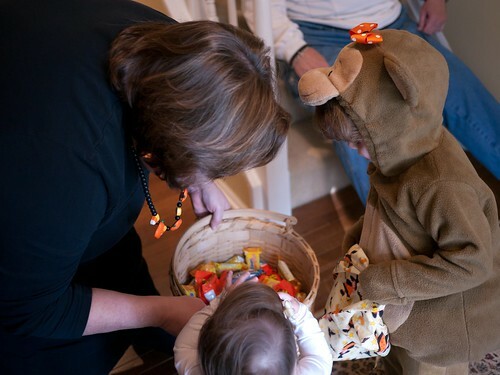 Halloween got started early with trick-or-treating at Grams and Pop's house. 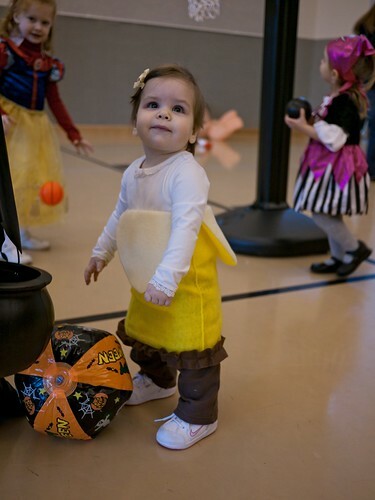 Per Molly's request, Leah was a banana. 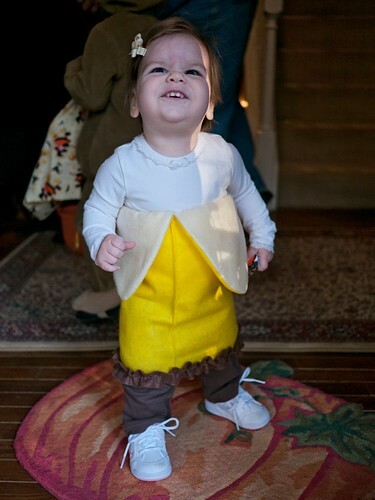 So, here's our cute, little peeled banana. 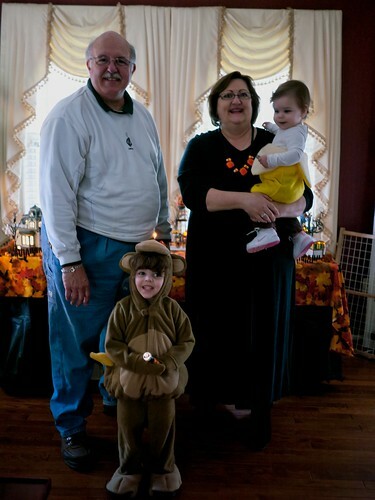 Everyone posed for a quick pic before heading to our next Halloween destination. 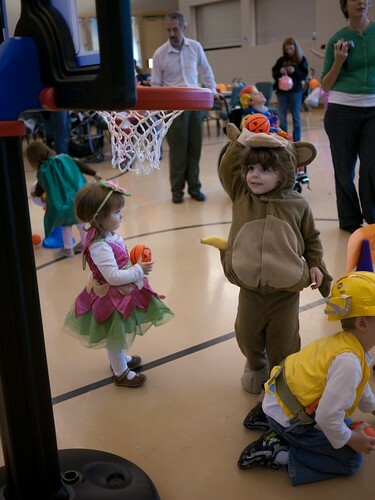 We then headed to church where they had lots of Halloween games for kids. Molly showed off her basketball skills. Leah got in on the playing as well. Simon and Matilda came to the party too. Molly picked all of our costumes. 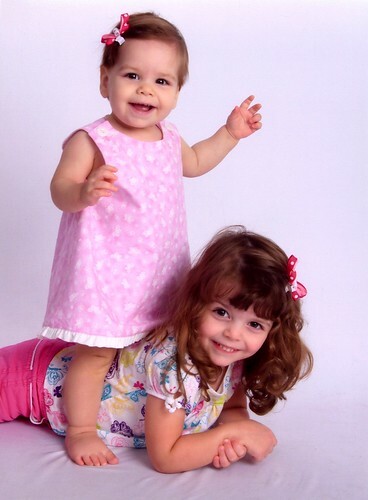 She first decided she wanted to be a monkey, then that Leah had to be a banana to accompany her. Then, she decided that Chad and I would be trees for her to climb on (banana trees, to be specific). 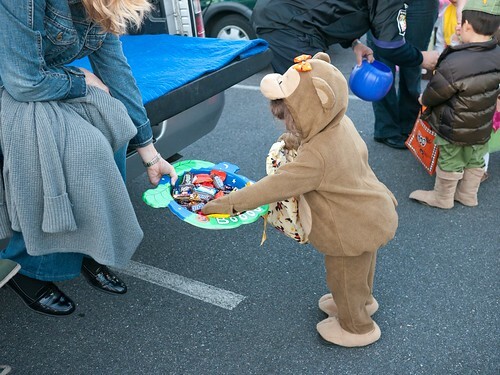 We borrowed Molly's monkey costume, but I made the rest. 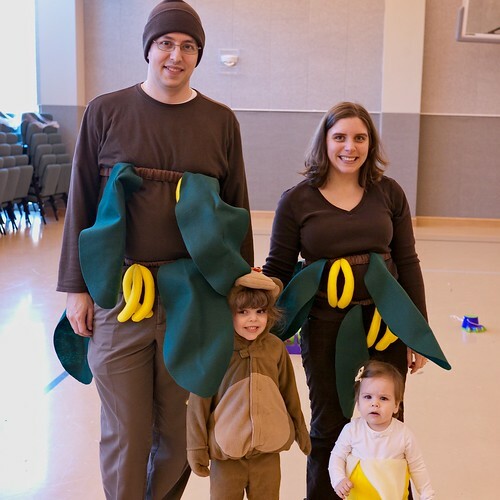 We even took the prize for best family costume. 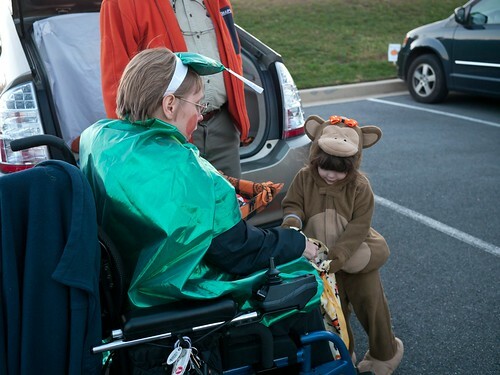 After the games, we went outside for trunk-or-treating. 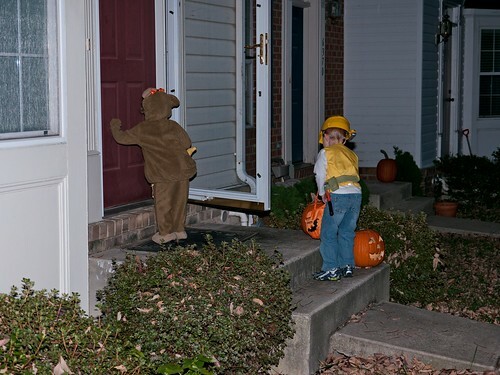 This led to lots and lots of candy. 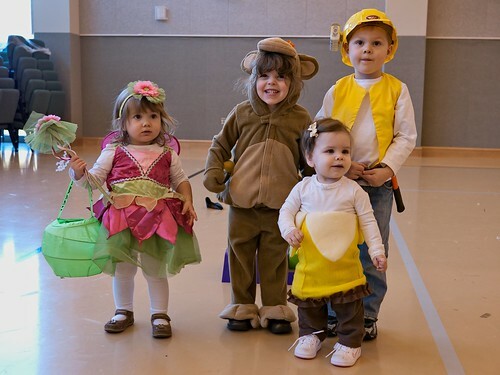 Since Molly's now in preschool, she gets to celebrate Halloween with her class. Parents were invited to come see them recite a couple poems and sing a song. As you can see, Molly was a bit excited. If you think you're hearing some extra voices, you're right, as there are more kids off to the right that I couldn't fit in the shot.